On Thursday, the United States, Iran and five other world powers reached a tentative agreement that would limit but not destroy Iran's nuclear program. Its intent is to prevent Iran from building atomic weapons, but as CBS News Senior National Security Analyst Juan Zarate emphasizes, "the devil's in the details." Under the framework, Iran would reduce its ability to enrich uranium for at least 15 years, cut its centrifuges by two-thirds, and it wouldn't build any new uranium-enriching facilities for the next 15 years. And then, once the International Atomic Energy Agency (IAEA) is able to verify Iran's compliance, the E.U. and U.S. would lift their unilateral sanctions related to Iran's nuclear program. "This is a framework to get to the agreement, and so the devil's going to be in the details, and they're going to be many devils at play here in terms of specifics and what the Iranians and what the west agrees to," Zarate said. "[T]his is one of those types of framework agreements that is sort of like a glass that is half-full," Zarate stated. The deal has some dimensions that are interesting and important in terms of restrictions on the Iranian nuclear program, inspections and restrictions over time, but Zarate said, "The half-empty part of this - the question of what's outside of the bounds of the agreement and whether or not you can actually trust what the Iranians say and pledge - really becomes fundamental." And, Zarate points out, the 10-, 15-, or 25-year timelines for some parts of the agreement "may sound good, but at some point, are you legitimating a more aggressive Iranian nuclear program that frankly, looks different from the restrictions we've put on friendly countries, like South Korea?" 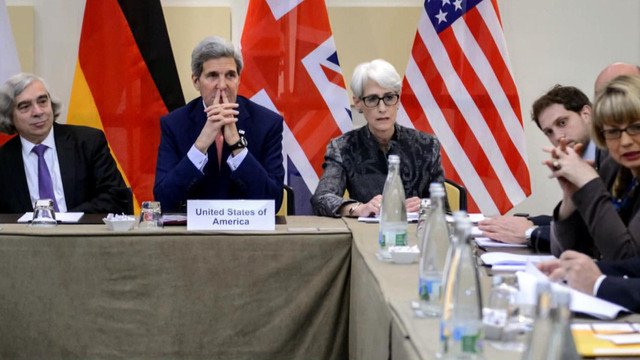 Negotiators have until the end of June to complete a final long-term accord on Iran's nuclear program.